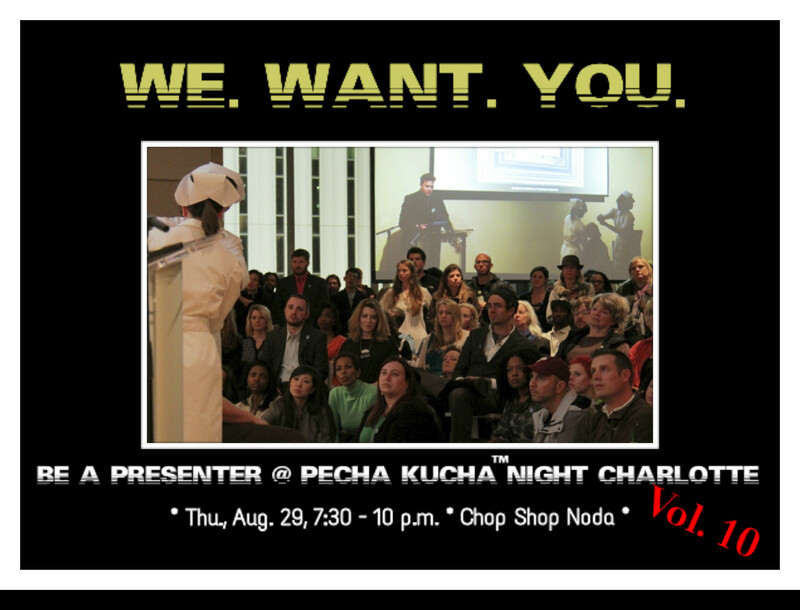 See who is presenting at Pecha Kucha Vol. 11! 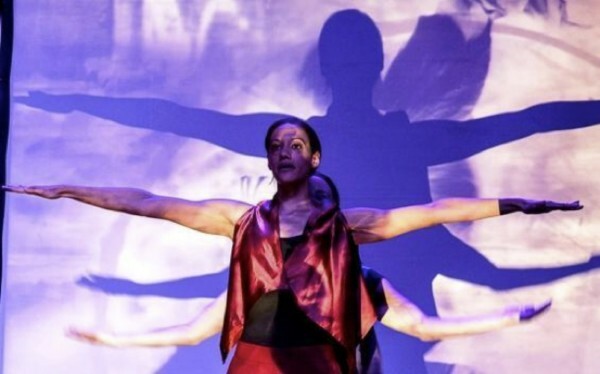 We are very excited to present a highly accomplished and diverse lineup of presenters/performers, and some very innovative and creative collaborations. 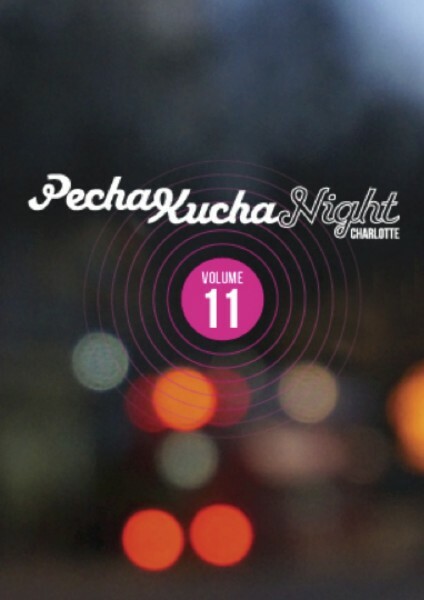 Volume 11 of Pecha Kucha Night Charlotte is organized by Que-OS. It is made possible, in part, with funding from the Arts & Science Council. Pecha KuchaTM is devised and shared by Klein Dytham Architecture, Tokyo. 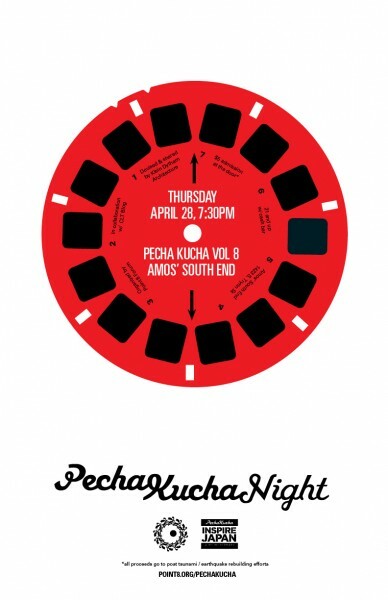 Posted: February 27th, 2014 under Events, Presenters Comments Off on See who is presenting at Pecha Kucha Vol. 11! *Due to the #cltsnow2014 #snOMG ~ we are extending the deadline for sending in final presentation packages to Monday, 2/17, at 5:00 ~ Good luck! Here is to fresh beginnings, as Pecha Kucha Charlotte is back with a new series of PK Nights. The first one for the year will be on March 13. …for sending in the final presentation package: 5:00 PM on Monday, February 17. Please note: We will be limiting the total number for Vol. 11 to 10 presentations. A panel made up of artists and designers will be selecting the final list of presenters. The selection will be based on the quality of the entries, and the originality of the theme/ideas submitted. We also try to ensure the inclusion of a really wide range of media and topics. Meet the Presenters & Join us for the Vol.10 Celebrations! 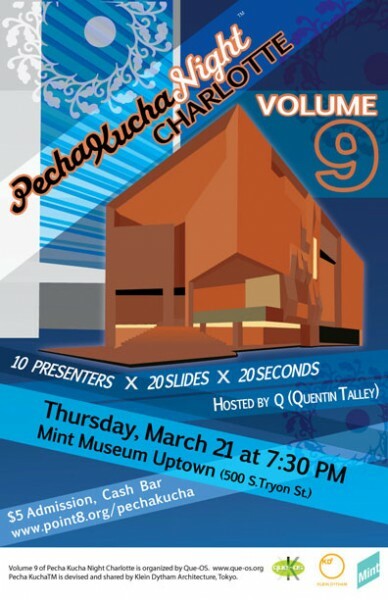 Join us to celebrate the 10th Volume of Pecha Kucha Charlotte with 10 great presentations/performances – and an After Party! Pecha Kucha is devised and shared by Klein Dytham Architecture, Tokyo. Posted: August 16th, 2013 under Events, Invitations Comments Off on Meet the Presenters & Join us for the Vol.10 Celebrations! We are “turning 10”, and we are back in NoDa! After our sold-out comeback event in March at the Mint Museum, we are excited to announce our landmark Vol. 10. We are also excited to be back in Noda after nearly 4 years. Get your presentations ready to be a part of this special occasion. Please note: We will be limiting the total number for Vol. 10 to a maximum of 10 presentations. A panel made up of artists, designers, and architects will be selecting the final list of presenters. The selection will be based on the quality of the entries, and the originality of the theme/ideas submitted. We also try to ensure the inclusion of a really wide range of media and topics. The deadline for sending in the final presentation package: 5:00 PM on July 31. Pecha Kucha Vol. 9 – Meet the Presenters! performances of music, theater and dance. Posted: March 12th, 2013 under Events Comments Off on Pecha Kucha Vol. 9 – Meet the Presenters! …and this is your chance for 6 min. 40 seconds of fame! 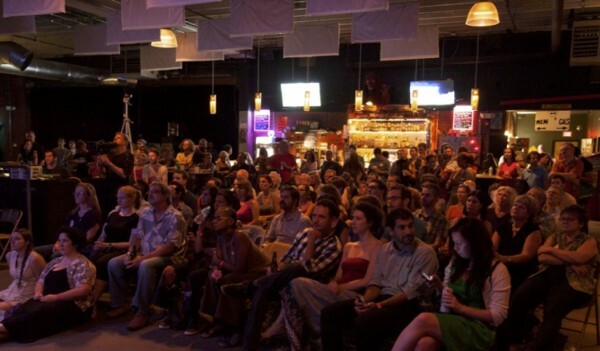 Since its inception Pecha Kucha Nights have been the one of the most acclaimed and popular cultural events in town. Now after a long hiatus, they are starting up again. This time we will be at the beautiful 5th floor meeting space at the Uptown Mint Museum. We know you have amazing, brilliant, and wildly creative things to share – and this is your chance todo it. As always, the only limitations are 20 images, 20 seconds per image, for a total of 6 minutes 40seconds. No other rules, except – make it extraordinary! Please note: We will be limiting the total number for Vol. 9 to a maximum of 10 presentations. A panel made up of artists, designers, and architects will be selecting the final list of presenters. The selection will be based on the quality of the entries, and the originality of the theme/ideas submitted. We also try to ensure the inclusion of a really wide range of media and topics. The deadline for sending in the final presentation package: 5:00 PM on February 28. Got questions about presenting? Email us at [present.pkn@point8.org] Or Our Contact Form. the making of a successful event – please let us know. We are always looking for new people, ideas & voices. Pecha KuchaTM is devised and shared by Klein Dytham Architecture [http://www.klein-dytham.com/],Tokyo. Indrani Nayar-Gall, Timothy Vang, and introducing: Charlie Black. All the door proceeds from PKN Volume 8 would go to the post earthquake-tsunami rebuilding efforts in Japan. It will be a part of “Inspire Japan” – a global initiative led by the Pecha Kucha HQ in Tokyo along with Architecture for Humanity in which 120+ cities from around the world are participating. Since PKN is volunteer driven – at the local as well as global level – and do not have any overheads or administrative costs, 100% of what is collected will go to the rebuilding work. Pecha Kucha(TM) is devised and shared by Klein Dytham Architecture, Tokyo. All the proceeds from Volume 8 would go to the post earthquake-tsunami rebuilding efforts in Japan. What you can do: The cover will be the same as always – $5 – you don’t have to pay anything extra. (Since we are volunteer driven – at the local as well as global level – and do not have any overheads or administrative costs, we will be able to send 100% of what we collect to Japan). However you can help by helping spread the word, and by encouraging others to attend. Hope you can be there. Posted: April 13th, 2011 under Events Comments Off on PKN8 is coming!